Introducing Blue's line of performance carbon endurance/gravel bikes. The Prosecco is specifically designed to provide comfortable positioning and offer a smooth ride, regardless of the conditions. 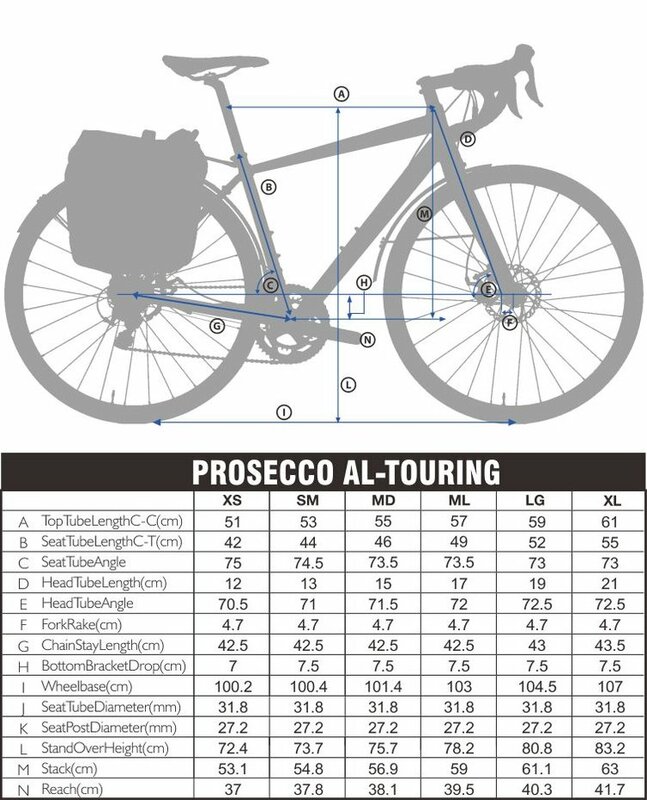 To increase the comfort of the Prosecco AL-Touring frame design, has a lower top tube to help with dismounting whilst for better tracking and increased stiffness, the Prosecco Touring employs thru-axles front and rear. Very pleased with my purchase. Extremely good value for money. All comparable bikes are an extra couple of hundred quid at least. Looks very nice, has a comfortable saddle. I really like the reflective coating on the side of the tyres looks cool and adds to visibility. 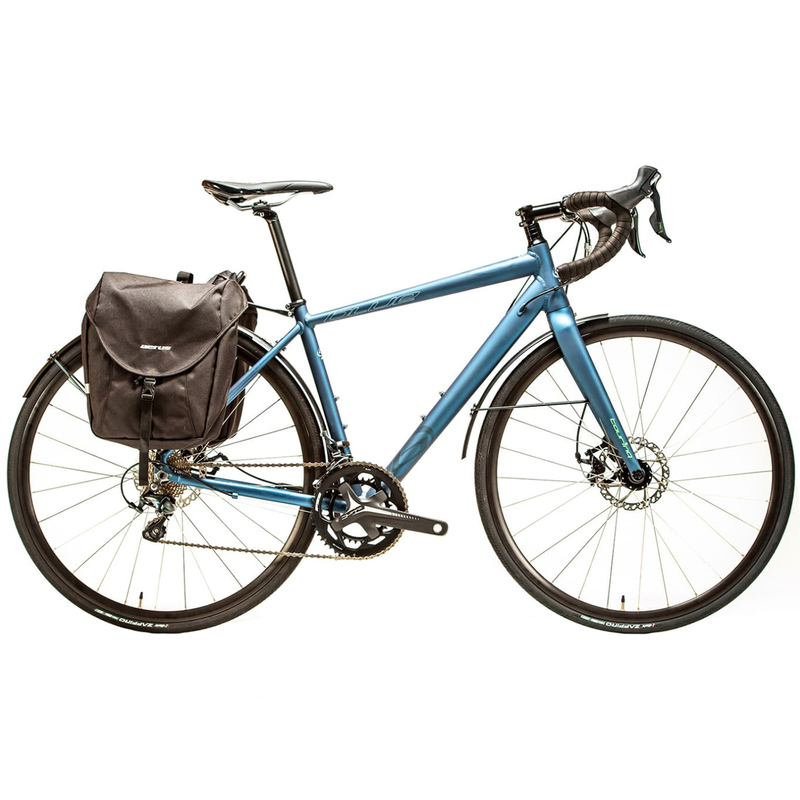 Really good comuting bike (maybe less so as a tournig bike as I don't believe a front pannier rack can be attached). I was worried that it would be a bit heavy as I've got a quite a few hills, but its lighter than I thought, considering its got a rack, mudguards, big tyres and disc brakes. A few small issues is the brakes rub a bit, it doesn't affect performance but is a bit annoying. I took it to a bike mechanic who said that it was because the pads in the brakes were not completely straight and I'd have to wait for them to rub down. One of the mudguards was pretty skew wiff as well, but the mechanic straighted it out for me pretty easily. The mudguards are metal which is nice, but dont fully go around the wheel. I haven't cycled it in the rain yet, but I think they should suffice. Rarely the gears don't shift as nicely as I'd like, but are still way better than most bikes I've ridden. Pannier bag while doesn't have a strap for carrying off the bike is actually still quite useful. Definitely 5 stars overall. This is the most beautiful bike I have ever seen. Details, colors, finishing, everything is perfect. Great equipment for this price (incomparable with another bikes in this price). Solid axle, both front and back wheel. Unbelievable! This bike is great, it was easy to put together when it arrived and a very smooth cycle. I use it to commute around London but will be taking it on a trip around Europe which I am very confident about now I have the bike. Recieved this bike very promptly, easy to assemble and ready to ride in no time. Great bike very comfortable ,looking forward to many rides in the future. Five stars indeed .